← >Would you buy a used car from this man? 1. 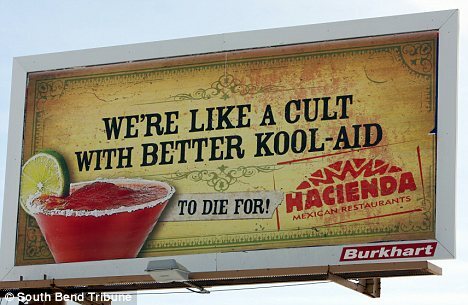 The ” ads you won’t see at the Super Bowl” award to Hacienda restaurants in South Bend, IN for the above billboard which refers to the mass suicide of 900 followers of Jim Jones in Guyana in 1978. The restaurant was forced to remove the billboard because of so many complaints by offended citizens. In a statement that is sure to be nominated for “spin” of the year, the VP of Marketing said “while we want to be noticed, we don’t want to be too controversial or edgy. We don’t want to be viewed negatively in the local area”. Maybe a special “Branch Davidians eat free” night would smooth things over. 2. The “rob like an Egyptian” award to the man in Pittsburgh who robbed a convenience store dressed like a mummy. Police put out the following “wanted” description: male, between 5’7″ and 5’9″ tall and 140-150 lbs, missing several teeth and may answer to the name of “Tut”. 3. The “I just thought he was a sound sleeper” award to Patrick Lara of Merced, CA (where else?). Lara kept his uncle’s dead body in the house for 30 days while he used his bank and credit accounts to gamble. Lara says the uncle allegedly died of an untreated broken arm (you can’t make this stuff up). The smell of the decaying body caused Patrick to turn on the swamp cooler, which weakened the roof, which caved in. That caused mold to grow on the corpse. Charges are pending. Homicide is definitely in play but only because sheer stupidity is not a capital offense. 5. The “taking food fights to a whole new level” award to Hersha Howard of Naples, Florida. Howard went on a rage and severely beat and bit her roommate Jasmin Wanke because Wanke had eaten her box of Thin Mint Girl Scout cookies. And you thought you were addicted to those! Did I mentioned that Howard weighs in at 400 pounds? Apparently, Howard had consumed the rest of the truckload of thin mints herself. 6. The “it’s all downhill from here” award to Roland Fleck, a retired 78 year-old doctor. Roland was arrested at a ski resort in Jackson, Wyoming for skiing uphill. When he refused to stop he was handcuffed and led away on a toboggan. Resort officials said avalanche dangers and snow making machines created a hazard for the skier. He was jailed on charges of trespass and unsafe skiing. Unsafe skiing? Isn’t that redundant? 7. The “even your best friends won’t tell you” award to the man in Beijing, China who has had a 4 inch knife blade stuck in his head for 4 years. The man had been robbed and stabbed back then, but unbeknown to him or his family, a part of the knife blade had broken off and stuck in his skull by his right jaw. Noting that he had been having severe headaches, difficulty breathing and halitosis all those years, the man finally went in for x-rays and voila! Doctors removed the blade but cautioned the man that he will never again be as sharp as he was before the operation.